"A fascinating story . . . Those who delighted in Caro's Power Broker will relish City in the Sky." The World Trade Center was the biggest and brashest icon that New York has ever produced-a pair of magnificent giants that became intimately familiar around the globe. In this vivid, brilliantly researched narrative, New York Times reporters James Glanz and Eric Lipton re-create the life of the World Trade Center from its genesis in David Rockefeller's ambition to rebuild lower Manhattan to the spirited battles with local storeowners and powerful politicians who opposed it, to the bold structural engineering innovations that would later determine who lived and died in its collapse. And like David McCullough's The Great Bridge, City in the Sky is a riveting story of New York itself- of architectural daring, political maneuvering, human ambition and frailty, and a lost American icon. James Glanz is a science reporter for "The New York Times "and has a doctorate in physics from Princeton University. Eric Lipton is a metropolitan reporter for the "Times" and the winner of a Pulitzer Prize for explanatory journalism in 1992. Since September 11, 2001, they have investigated the attack on the World Trade Center and the aftermath. They both live in New York City. 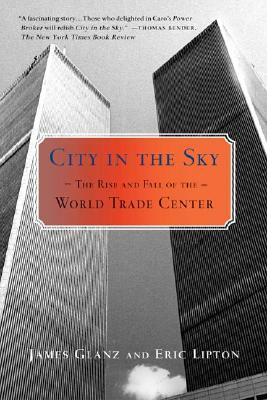 "James Glanz and Eric Lipton's brilliantly reported and profoundly moving but admirably clear-eyed account of the accidental conception, long gestation, difficult birth, brief life and tragic death of the World Trade Center is likely to remain a classic."